The rich nutrients in garlic are often overlooked due to the odor the plant leaves on the breath. Though odorless garlic can be grown, it doesn’t contain the same potency of healthy nutrients that regular garlic does. 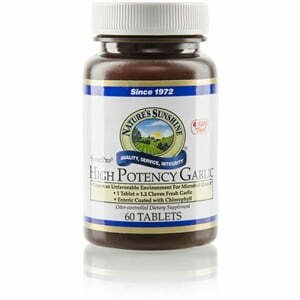 Nature’s Sunshine Garlic, High-Potency, SynerPro® is the finest and most potent garlic available, but a special coating on each capsule controls the distinct odor of garlic. The coating, which contains chlorophyll, is specially prepared to lock in freshness. Instead of breaking down early in the digestive process, the capsule is not absorbed until it has made its way to the small intestine, allowing the body to benefit from all the nutrients contained in garlic without the smell or taste. Compared with other brands, Nature’s Sunshine High-Potency garlic has the most allicin potential and is highly valued for its quality and potency. 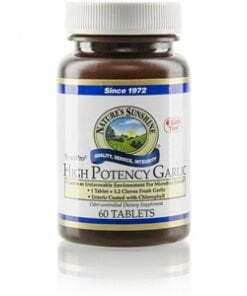 Each capsule is 400 mg, comparable to 1,200 mg of fresh garlic or about one clove. Instructions: Adults: Take one tablet with a meal once or twice daily. Children: Take 1/2 tablet with a meal once or twice daily.